If you are planning to work, do business, or live in Bahrain, you will need to submit certain key business, legal and even personal documents in Arabic to certain government bodies. These must be translations carried out by a translator certified by the official bodies concerned, otherwise they will be rejected. Certified translations must be as close to the original document as possible, not just in terms of accurate content, but also layout and any stamps or other such markings. Only then will they be accepted by the Notary Public who provides the attestation on the translated document. 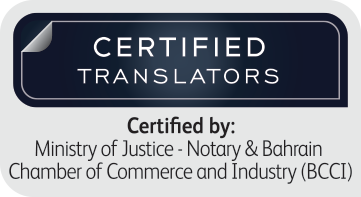 Fortunately, PRIME Translation is certified by all the relevant bodies in Bahrain, including the Ministry of Justice, the Notary Public, and the Bahrain Chamber of Commerce and Industry (BCCI). We can provide fast, accurate and cost-effective translations for any documents you might require. Which documents require a Certified Translator? Documents relating to the civil registry (birth certificates, marriage certificates and so on). Deeds (titles), school certificates, degrees and diplomas, affidavits, witness statements and court rulings. All documents to be produced before an official body or an authority (municipalities, ministries, consulates and so on). Certified translations are also necessary for legal paperwork, such as documentation used in trials or hearings. Immigration is also a key area that nearly always requires certified translation. If you are applying for a residency, it will likely require that all documents be submitted in Arabic and that translations of these documents must be certified. Documents related to trademark and patent applications. All supportive documents should be submitted to the Trademark Office and the Patent Office translated into Arabic by a certified translator. Documents which require legalisation by most government bodies. PRIME Translation provides reliable document translation services of the highest quality and at a competitive price. All of our capable translation experts bring a great deal of experience to each project. As well as certified translations for government bodies, we offer high quality English to Arabic and Arabic to English translation for any documents you might require. We understand that for success and acceptance across borders, translations need to be technically accurate and linguistically clear; they should also have cultural insight in order to effectively communicate the sense of the document. That’s why we use only the best translators. We also provide copywriting services, offline and digital, including websites, and translation of marketing materials from English to Arabic and vice-versa. Our translators are also able to offer translations into and from Arabic for languages other than English.